The Droll Yankees Winner Window Bird Feeder offers the opportunity to observe bird behavior and feeding habits from inches away. There is no plastic between you and the birds to obscure your vision. The triple suction cup mounting style and size of this feeder make it perfect for almost any window. Add additional feeders to establish multiple feeding zones and offer different combinations of nearly any seed, fruit, or mealworms in the individual feeding tray to attract a wide variety of birds. The deep dish feeding tray has a two cup capacity and is equipped with drainage holes to keep seed dry and fresh. 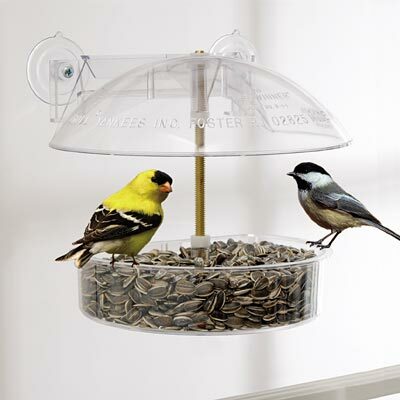 The clear plastic feeder dome is adjustable to select against larger birds and acts as a weather shield to protect birds and feed from the elements. Cleaning and filling is easy and convenient; simply lift the feeder from the suction cups or open your window to add to the tray. The feeder may be mounted to your window with the included suction cups. Made in the USA. Lifetime Guarantee. Capacity: 0.5 qts. (2 cups), 0.75 lbs.